Red Line hydraulic breakers from Green Attachments have been designed to perform all types of demanding tasks of different applictions and materials. Green Attachments Red breakers are used at the open and close mine and quarry applications. Also typical applications are excavation assistance, demolition, tunnel construction, underwater application, boulder breaking etc. Movement is achieved by the hydraulic oil pressure on the piston head and speeded up by the oil and gas load of the accumulator on the top of the piston. The main function of this accumulator is to keep the pressure same all the time at the top of the piston. Gas must be added only during service. The membrane type breakers are fully hydraulically operated and this gurantees reliable operation when productivity matters. They can operate in all possible positions due to long and light piston and a large number of seals. Hammers are designed to have an option for underwater operations. Also specially reinforced stone housing available. Continuous lubrication during operation available as an option. 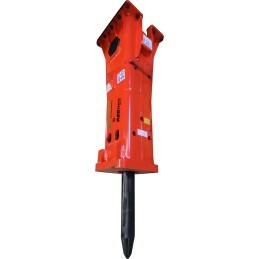 The range consists of nineteen (19) hammer models for 0.75 to 100 tonne excavators (1 650 – 220 500 lb). Hammers have well designed hydraulics to minimize overheating. The buffer system (side, top and bottom buffers) that is used in Red breakers, has a special impact and vibration absorbing properties. Side rods are covered with the polyurethane to reduce stress and vibration on the thread.